I have the Fanatec Clubsport V2 wheel on the Xbox and kept my actual wheel settings the same as in FM6. Any adjusting I did was in the demo only. One thing I have noticed is there is absolutely no road feel at all! I have vibration all the way up and feel curbs and other cars bumping me but no road feel. A small amount on the Cobblestones but on a normal road going straight the wheel is dead. This felt pretty decent for a start. I will be fine tuning my settings more after the game comes out when it is finalized. I would hate to have them change something and have to start all over again. This is good enough for me with the demo. Once the cars are tuned some it will get even better but I really hope they add more road feel in the wheels. Anyone got decent settings for the G920? I'm using the same settings I use in FM6 and it's just not working. Only had the wheel for a few weeks so I still don't know what each setting does. The settings I posted above are only changing the settings in the Demo...in other words I changed nothing on my wheel from FM6 to the Demo. I did that on purpose so hopefully any wheel that worked decent in FM6 with these settings should give a decent starting point. My theory is matching both game settings as close to each other in game settings only and no wheel adjustments any wheel hopefully would react the same but I have no way of knowing if this is true. Only thing I've noticed so far is to run the Wheel Damp between 40-75 and to run the Center Spring from 50-100... still fine tuning to find the sweet spot that works for all DOR. I figured out what the problem was. I had vibration strength on 100 so I dropped it to 50 and now it's much better. Every time I lost traction the wheel was shuddering really bad and moving the table it's mounted on. It's only a small table so it's pretty easy to move as it is. I have adjusted my settings in post #2 of this thread and like this quite a bit. This is on XB1 with a G920. Everything else is default. I don't know if that's the "correct" settings to have but the truck and Nissan races are fine. The 911 race on the other hand is terrible and I don't know why. T500RS - PC (no on wheel config) connected to a Inateck USB3.0 PCIe card - powered via PSU. All deadzones 0 - 100, clutch 0-0. My Thrustmaster control panel is basically defaults apart from master scale at 50%. The center strength of align torque falls into the Force Feedback slider. This is where align torque lives and where the Force Feedback Minimum and Understeer values are intended to help. Our align torque has always come from our extensive tire tests and was defined as the pneumatic trail of the tire. One of the largest changes this time is the addition of mechanical trail. Mechanical trail doesn't diminish as much as pneumatic trail at break-away. This is the missing magic force that makes the wheel follow through in oversteer and we touched on it slightly in FH3 but it was overrun by the spring. It's a double edged sword; more mechanical trail means more subtle feeling at the edge of understeer since there is now another force beyond peak slip angle. Basically, we're trading understeer feel for oversteer feel. Force Feedback Understeer is intended to allow you to find your balance between understeer and oversteer. At the moment, it isn't working as intended. This brings me to my final point. In working with the Elite I discovered an issue with custom mappings which in some cases is turning off force feedback. The forces you're experiencing may be coming entirely from your wheel and not at all from the game. We're looking into this now. Talking to brick walls since 2007. Dust,would this be a good starting point for my TX on the console?Thanks. I have spent a number of hours. Turned everything off entirely in game and then proceeded to run laps of dubai moving only one thing at a time incrementally while retesting.... I think Im done. Feels pretty much the same across all cars in the demo. my control panel settings, for those with on wheel features for console. EDIT: 50% = 80% strength. Shuddering is caused by the center spring. I haven't touched that or the other of the bottom two settings because I don't know what they do and there's no info from the game to help you. I've only had the wheel for 2 weeks so I'm still getting used to it. This is my first post here , i just want to know that is Thurstmaster T300 Ferrari Alcantara edition supported in FM7 , i red the supported wheels for FM7 on PC that is why i bought this wheel , now i saw a post in which they are only showing only Xbox supported Thrustmaster wheels for the demo , so i am a little confused . What PC peripherals are supported in the demo? What Xbox peripherals are supported in the demo? I wasnt aware of your sneaky sub forum making. I have corrected my post. Thanks Max. Driver Version: 2017 Package 4 (via pc settings) and Firmware v50 - no changes made in the Thrustmaster control panel. I like a light but communicative wheel, like the real wheel feel in a Lotus Elise, not so much force I have to fight the wheel. Normal steering also seems more communicative through the wheel, with sim steering I find I need expert throttle control in the Porsche. These are for Logitech Driving Force GT. As you can see the settings in the Logitech Global Device Settings are pretty much defaults, except that I ticked on the "Enable centering..." and one can set the DOR to their liking. The Porsche felt quite ok with these settings (at least during one full two-lap-race), so if you have the same wheel you could have a try and start from these. The vibration feels extremely strong with DFGT. If I have it on 50+ it feels like my whole table rumbles when a small pile of sand gets under the wheels. Another one here on a TX 458, I've tried most settings and I can get no feel of the road surface. I get vibration on the curbs and off track, but the actual circuit feels utterly dead and lifeless. The cornering forces are strong but there's no sensation of grip. Not too impressed at the handling and hope it's a bug. If you no longer go for a gap that exists, you are no longer a racing driver because we are competing, we are competing to win. 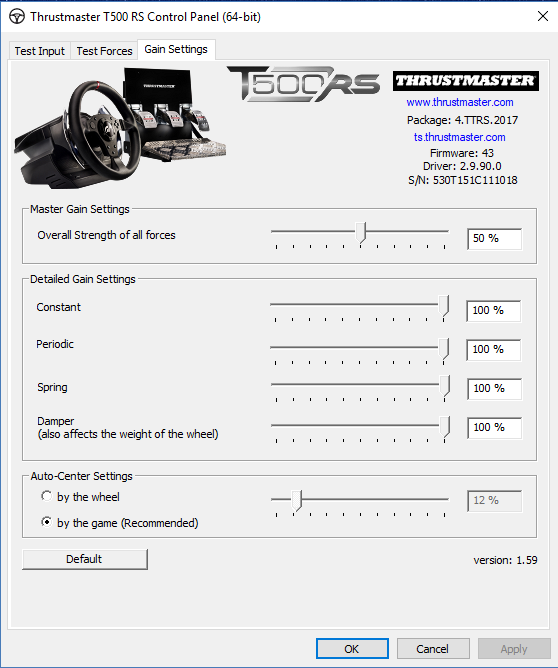 Here's my settings so far for the wheel (Thrustmaster TX). Bare in mind I like my wheel to be very heavy and strong. Works great @ 900° for the Porsche and at 540° For the Nisssan and the Truck. Edit: Will be doing some more testing tommorow. Will update my post then. After 12 hours of playtime and endless tweeking of controllers, this is my best setting, so far. Using a Thrustmaster T300 Ferrari Alcantara and TH8A shifter on PC. First of all if you are using a Thrustmaster. 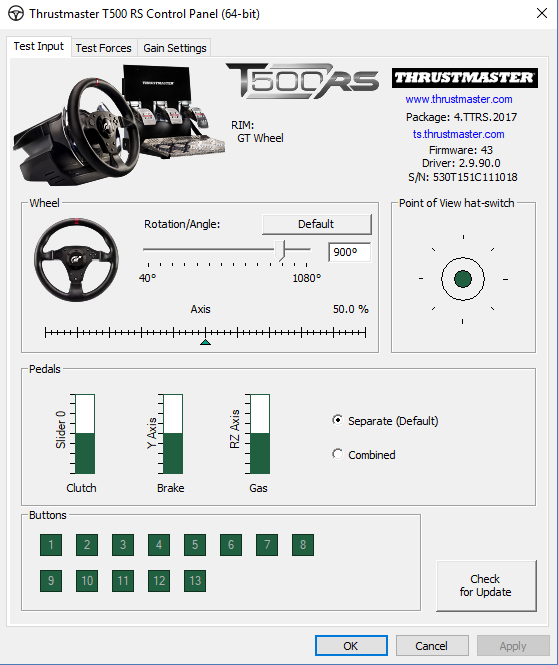 Download the latest driver at Thrustmasters website. Download manager in Thrustmasters control panel is broken. So you have to download it manual. Plug of your wheel when updating. Its not 100%, but for me its the best setting yet. Even the Porsche without any assists, manual with clutch, exeept ABS active, is now capable to drive. The GTR feels more than okey if i compare to default settings. But still i would like to have more feeling from the car. Something is missing. Evan why is your min force so high? Just found this post. I will try post #2 Settings again tonight. The demo is unplayable with a wheel. Does anyone have some miracle settings for the Fanatec CSW V2?